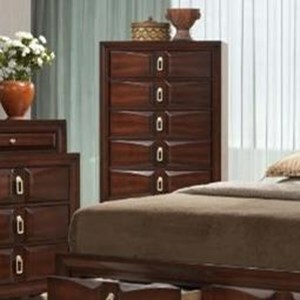 Five large drawers make room for all your belongings in this chest of drawers. Chrome finished loops adorn the drawer fronts and lay delicately against the white finish of this chest. 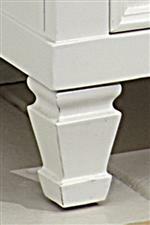 Crown moulding and carved feet offer classic design to match your bedroom design. 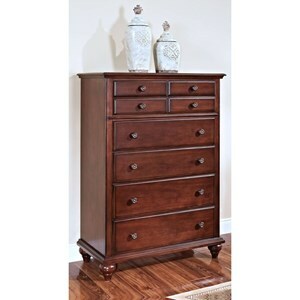 With modern and classic inspiration, this chest offers a transitional look for your uptown loft or country cottage. Match this dressing chest with your favorite decor to turn this functional storage piece into a stylish statement. 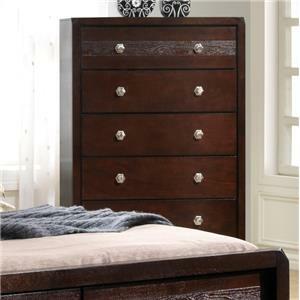 The Tamarack Five-Drawer Dressing Chest by New Classic at Casa Leaders Inc. in the Wilmington, Long Beach, Torrance, Lakewood, Los Angeles area. Product availability may vary. Contact us for the most current availability on this product.